Extant Manuscripts of the Maḥzor. Additions to the Maḥzor Proper. French Talmudist of the eleventh and twelfth centuries; died in 1105. He was a pupil of Rashi and the compiler of the Vitry Maḥzor ( ), which contains decisions and rules concerning religious practise, besides responsa by Rashi and other authorities, both contemporary and earlier. The work is cited as early as the twelfth century in R. Jacob Tam's "Sefer ha-Yashar" (No. 620) as having been compiled by Simḥah; and the sources from which the compiler took his material—the "Seder Rab 'Amram," the "Halakot Gedolot," and others—also are mentioned. R. Isaac the Elder, a grandson of Simḥah, also refers (responsum No. 835, in "Mordekai," on M. Ḳ.) to the Vitry Maḥzor compiled by his grandfather. Various additions were afterward made to this maḥzor, a large proportion of which, designated by the letter ת (= "tosafot"), are by R. Isaac b. Dorbolo (Durbal). The latter often appends his name to such additions; and in one place he says plainly: "These explanations were added by me, Isaac b. Dorbolo; but the following is from the Maḥzor of R. Simḥah of Vitry himself" (Vitry Maḥzor, p. 244). Other additions are by Abraham b. Nathan Yarḥi, author of "Ha-Manhig," and are designated by the letters , his initials. Three manuscripts of the Vitry Maḥzor are extant, the oldest of which, according to Berliner in his additions to Hurwitz's introduction to the Vitry Maḥzor (p. 172), is that in Reggio. It contains the Vitry Maḥzor proper without any additions. A second manuscript, in the Bodleian Library, Oxford (Neubauer, "Cat. Bodl. Hebr. MSS." No. 1100), is said to have marginal annotations by Eleazar b. Judah, author of the "Sefer ha-Roḳeaḥ" (Michael, "Or ha-Ḥayyim." No. 1214). The third manuscript is in the British Museum (Cod. Add. Nos. 27,200 and 27,201), and contains still other additions; this manuscript served as basis for S. Hurwitz's edition of the Vitry Maḥzor published by the Meḳiẓe Nirdamim Society (Berlin, 1893). The edition is very faulty, as the editor used no critical judgment in his work; instead of the original treatises it contains some from the "Sefer ha-Terumah" of Baruch b. Isaac and from the "Eshkol" of RABaD (Vitry Maḥzor, pp. 752 et seq.). The Vitry Maḥzor contains many prayers and liturgical poems("piyyuṭim"), which are distributed throughout the work. Besides these scattered poems the British Museum manuscript has (pp. 239-260) a collection of piyyuṭim which was published by Brody under the title "Ḳonṭres ha-Piyyuṭim." (Berlin, 1894). 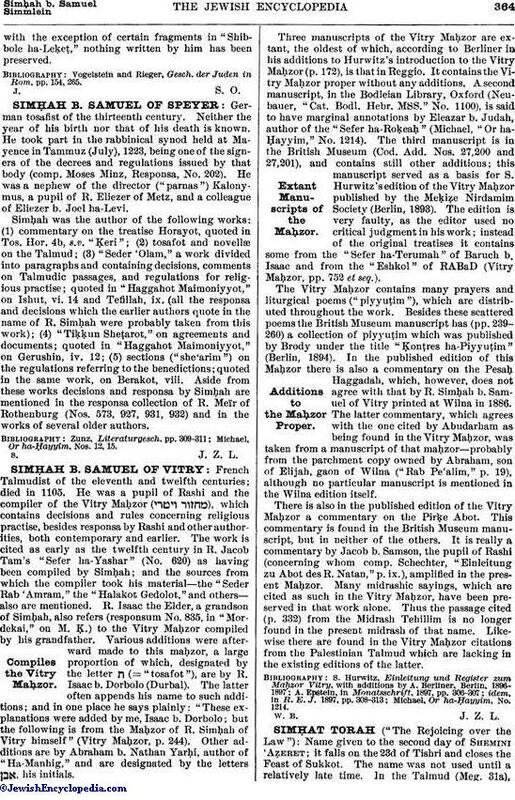 In the published edition of this Maḥzor there is also a commentary on the Pesaḥ Haggadah, which, however, does not agree with that by R. Simḥah b. Samuel of Vitry printed at Wilna in 1886. The latter commentary, which agrees with the one cited by Abudarham as being found in the Vitry Maḥzor, was taken from a manuscript of that maḥzor—probably from the parchment copy owned by Abraham, son of Elijah, gaon of Wilna ("Rab Pe'alim," p. 19), although no particular manuscript is mentioned in the Wilna edition itself. There is also in the published edition of the Vitry Maḥzor a commentary on the Pirḳe Abot. This commentary is found in the British Museum manuscript, but in neither of the others. It is really a commentary by Jacob b. Samson, the pupil of Rashi (concerning whom comp. Schechter, "Einleitung zu Abot des R. Natan," p. ix. ), amplified in the present Maḥzor. Many midrashic sayings, which are cited as such in the Vitry Maḥzor, have been preserved in that work alone. Thus the passage cited (p. 332) from the Midrash Tehillim is no longer found in the present midrash of that name. Likewise there are found in the Vitry Maḥzor citations from the Palestinian Talmud which are lacking in the existing editions of the latter. Michael, Or ha-Ḥayyim, No. 1214.